The History of "Man Midwife"
by F.C.Gapultos, Jr. M.D. F.A.C.O.G. 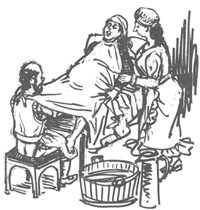 Because of modesty, a "man midwife"often times had a sheet tied to his neck and the other end was tied tohis patient's neck, thereby manipulating delivery blindly. Childbirth for the primitive woman was done outside her dwelling. She went out into the woods or nearby stream or a hut to deliver her child,accompanied by a female friend or a neighbor. These women were the precursors of midwives. Midwives from the primitive times to the Middle Ages were relegated solely to women. Women who were assigned the task of delivering babies were the old, the ignorant, and the careless. The only qualifications were being past her childbearing age, and having at least one child of her own. Early physicians or barber surgeons who were all male did not participatein labor at all during Hippocrates time (circa 500 BC), until after the end of the Middle Ages. In the middle of the 16th Century, Abroise Pare, a famous French barber surgeon performed podalic versions to deliver difficult deliveries. This was a procedure where the infant was pulled from the uterus by its feet to accomplish delivery. This laid the foundation of the participation of male physicians to delivery of infants. A man doing midwifery was called "man midwife", "he midwife", or "midman." The participation of men midwives were met with great resistance by midwives. In some quarters of society, men assisting the deliveries of women were ridiculed and were considered immoral. Dr. Wertt of Hamburg was burned alive for impersonating a woman so he could attend a class on childbirth. Man midwives were considered a lower class of doctors compared to medical doctors or barber surgeons. During Pare's time, a school of midwifery was opened in Paris, at the infamous Hotel Dieu, thus producing trained midwives. This paved the beginning of obstetrics as a science. Among the first "he midwife" was, Boucher, who assisted the delivery of King Louise XIV's mistress in 1670, and Juliann Clement, who attended several royal births, and was conferred the title accoucheur to distinquish him from the much maligned midwives of the time. Soon male midwifery became fashionable. Because of modesty, a man midwife often times had a sheet tied to his neck and the other end was tied tohis patient's neck, thereby manipulating delivery blindly. A common practice was for the the midman to stay in an adjacent room as standby help, while the midwife attended labor. 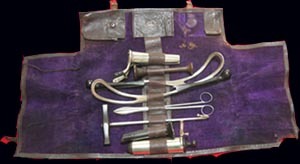 The Accoucheur'sAntique is a private collection of midwifery,obstetrical, and gynecological instruments used in antiquity. Throughthese medical antiques, the past comes alive. As one sees, touches, and feels, these vintage medical treasures, one can understand and experience first hand the frustrations, the few victories and the many defeats of health providers during the dark ages of medicine. These were modern instruments to them. One can sympathize with the trials of patient care as they differ from the present time. 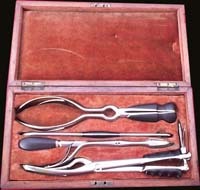 This medical antique collection allows one to truly appreciate the marvels of medicine we have today. As a source of educational entertainment, I have developed a web site that showcases some of the more unique, rare, and interesting pieces related to midwifery,obstetrics, and gynecology. All the items on this web page are part of my collection unless otherwise stated. Included are interesting, and many times amusing fact files; description of how, when and why the pieces would have been incorporated in the practice of midwifery, obstetrics,and gynecology. WARNING:The Accoucheur's Antique portion of the web site contains graphic pictures. Viewers discretion is advised. F. C. Gapultos, Jr., M.D. F.A.C.O.G. THIS PAGE WAS CREATED SUMMER OF1999. Mail this page toa friend! All statements in this web pageregarding date, age, and origin are statements of opinion. All photosand materials on this web page are protected by copyright laws. Pleaseobtain direct permission from to use any and all materials on this site, including photographs and drawings.